Looking for something really fun for your next party or event? If your kids are tired of the same old inflatable bouncy castles or are simply looking for something new, maybe its time to try a Rodeo Bull, Airborne Adventure or Surf Machine? Party Extras has been established on the coast for many years and have the most fun and up-to-date equipment to offer, including bouncy castles, if that is what you're looking for. 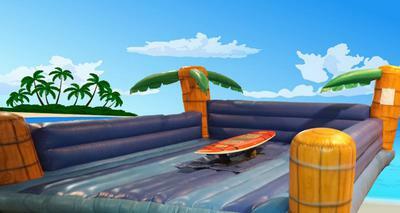 Catering for any fun-filled event and providing alternative party games throughout the Costa del Sol. With Party Extras there is something for every age group. All mechanical equipment is hired with a fully-trained, fun loving operator for the duration of the hire. This mechanical bull provides great entertainment for almost any type of function. Ideal for all ages, this simulated bull twists and bucks for rollicking fun for everyone. Intensity settings can be adjusted to accommodate any age group. Area Required: 5 x 5 meters. This fantastic life-sized electronic surf machine realistically simulates wave motion, making any event a special occasion. All ages can enjoy hours of fun on the specially controlled surf board. Intensity settings can be adjusted to accommodate any age group. Area Required: 4 x 4 meters. The surf machine comes with trained operators for a period of 4 hours. 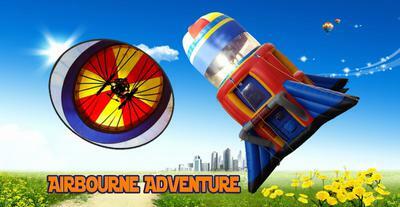 Airborne Adventure is the only answer for someone who wants something really different. This game has an inner capsule where one adult or child is harnessed into a parachute. A flick of the switch on a second blower and it’s up, up and away, raising them almost 20ft into the air for a birds eye view of the entire area. Turn off the blower and they are gently lowered back down to the ground. This gives "Hangtime" a whole new meaning! Rental includes setup and takeaway with a trained operator on the machinery, so your hiring experience is effortless and carefree. Contact Party Extras at their details, below. All enquiries are responded to within 24 hours.. Thank you for your enquiry for the hire of our mechanical bull. If you can supply an email address so we can send you the prices. Or alternatively you can email us mike@partyextras.net or call us on either of the above numbers supplied on this page. The date you require is currently available for this item. The mechanical bull requires a 5x5 meter flat area for use but, we are unable to put the equipment on the actual sand for the safety of the machine. 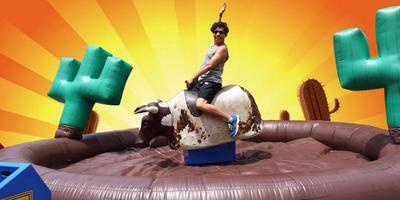 Thank you for your enquiry for the hire of our mechanical bull. If you can supply an email address so we can send you the prices. Or alternatively you can email us mike@partyextras.net or call us on either of the above numbers. The date you require is currently available for this item but will not be able to have the mechanical bull on the actual sand for safety of the equipment and it does require a 5x5 meter area to operate on. I'm sure they will be delighted to provide you with the information you need regarding your event in Benalmadena. hello im looking for a price on renting your mechanical bull for the 04/10/15 for outside salitos bar on the beach front IN Benalmadena for a couple of hours. Would this be possible.